This Friday is the 5th of May of course, and in some circles that is the Cinco de Mayo. Now, this has a special place in my heart as the history of the actual Cinco de Mayo festival is because the Mexican army beat the French all the way back in 1862 (according to Wikipedia anyway). Always like to celebrate the French being beaten! 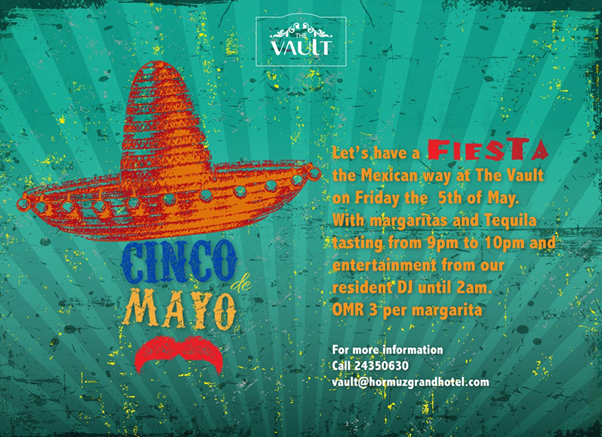 The people at The Vault, the bar at the Hormuz Grand are seeing this as an excuse to sample tequila between 9 and 10pm on Friday. Margarita's are RO 3 all night long till 2am. 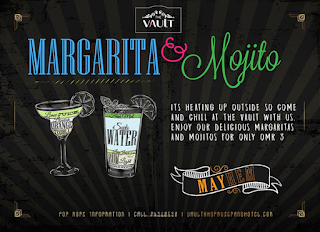 Then for the rest of the month (well, until the holy month arrives) there's a deal on Margaritas and Mojito's too.